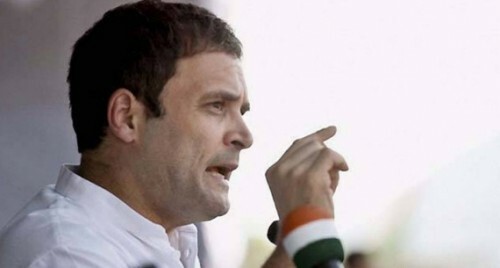 Satna (Madhya Pradesh), Sep 27 : Congress President Rahul Gandhi on Thursday once again targeted Prime Minister Narendra Modi over the Rafale deal, saying the country's "chowkidar" (watchman) has committed "chori" (theft). Addressing a public meeting in Chitrakoot in Satna district of Madhya Pradesh, Gandhi said: "Irregularities have taken place in the purchase of Rafale fighter jets from France. Modi took away Dassault contract for its India partner from Hindustan Aeronautics Ltd (HAL) to favour his friend Anil Ambani's company to make it the offset partner." "While the cost of each fighter jet was fixed at Rs 526 crore in the deal between India and France during the Congress regime, now the same aircraft is being acquired for a whopping Rs 1,600 crore," said the Congress President. On a two-day visit to Madhya Pradesh, Gandhi on Thursday arrived in Chitrakoot where he offered prayers at the famous Kamta Nath temple in this religious town associated with Lord Ram. He was accompanied by state Congress chief Kamal Nath and head of the campaign committee Jyotiraditya Scindia, among others. The Congress leader said: "The 'chowkidar' of the country is committing theft, that's why he is not able to have an eye-to-eye contact with the youth of the nation. While the government is not ready to disclose the price of Rafale jets citing a confidentiality clause in the deal, France says there's no harm in disclosing the price." Gandhi also raised questions over the issue of rising unemployment in the country. "At a time when the government is harping on 'Make in India' programme, the unemployment scenario is going from bad to worse. Today the situation is such that even the statue of Sardar Patel is coming from China. Chinese are making the statues of Patel while the youth of India is unemployed." He went on to add that if his party is voted to power in Madhya Pradesh, waiver of farmers' loans will be the first priority. "We will try to create employment opportunities for the youth and will replace 'Made in China' with 'Made in India' and 'Made in Chitrakoot'," he added.